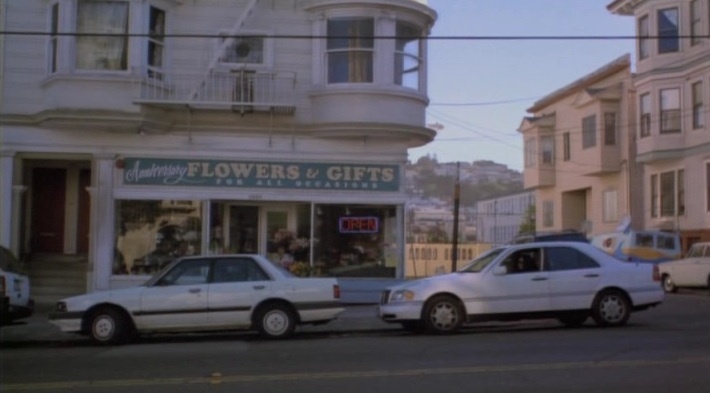 Johnny pulled his white sedan into a park, directly in front of his favorite flower and gift store, Flowers & Gifts, it's neon 'open' sign glowing invitingly into the San Francisco day. Of course, for Johnny, flowers and gifts were often one and the same. He'd come here twice a week for the past five years, the entirety of his and Lisa's love affair, and he wasn't about to stop now. Johnny was nothing but kind to his girl. He strode into the familiar gift store, flower pots and cheap pink greeting cards littered about. He locked onto the store keep whom he recognized instantly. Her hair styled in a short-lesbian cut, she wore a tan collared shirt and a stern expression. "Can I help you?" she replied, not looking up from her register. Johnny strode past a woman browsing through cards and up to the counter. "Yeah, can I have a dozen red roses please?" The shop keep looked up. "Oh hi Johnny, I didn't know it was you." She rushed off to make his bouquet, and returned within seconds with his exact order. This is why I come here so often! Johnny thought. She handed him the flowers. Johnny handed her a twenty. "Here you go! Keep the change!" He turned and pet the pug dog that was on the counter for some reason "Hi doggy!" "You're my favorite customer." said the shop keep as Johnny exited the store. And with the flowers safely it tow, Johnny ran out to his car. excited to surprise Lisa with another gift. The dialogue in this chapter is so riveting. You can feel the passionate exchange between Johnny and the flower shop lady. So he bought her the flowers. PS. THIS, '...Flowers & Gifts, it's neon 'open' sign glowing invitingly into the San Francisco day. Of course, for Johnny, flowers and gifts were often one and the same...' is redundant. Previous commenter is a nob. I don't get why you didn't comment that "The flower shop lady knew that, due to his slow auditory processing speeds, Johnny would often reply to a statement long after the conversation had moved on. "He'd come here twice a week for the past five years, the entirety of his and Lisa's love affair, and he wasn't about to stop now. Johnny was nothing but kind to his girl."